Abby Pierce was everything a man should avoid – with a figure made for temptation, a face of beauty, and an expression of stubborn determination. Colonel Bryce McGregor knew there was no room for such a woman at his fort or in his heart. But no matter how many obstacles he put in her path, Abby was determined to make a go of her father’s store. And as she received proposal after proposal from his troops, Bryce realized the only man he could allow to marry her was himself. The strength of purpose in the characters and the colorful backdrop makes this a truly memorable western. Leigh Greenwood unfolds his Westerns like an artist on his canvas and with a stroke of genius he creates vivid characters and rare plots. He allows his readers to get into the heads of the protagonists and become completely immersed in the story. THE INDEPENDENT BRIDE should be placed among the Western classics. 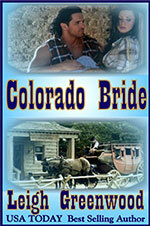 THE INDEPENDENT BRIDE takes turns being exciting, romantic, suspenseful, fun, and heartwarming. Taken as a whole, it’s a solid, rewarding work of fiction by a master of the genre. Leigh Greenwood is a powerhouse of a writer, known for captivating plots that pull the reader into the past and THE INDEPENDENT BRIDE is no exception. 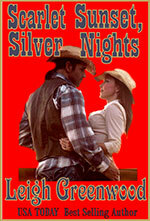 Greenwood has crafted a fun, romantic read guaranteed to delight long time fans as well as new readers. “There are few if any authors that can provide such well drawn characters including secondary players with a colorfully vivid nineteenth century Americana panorama inside an exciting historical romance as Leigh Greenwood can. Boulder Gap was a false-fronted, one-street town where the only way a fellow could find a decent woman was to send away for her. When Tanzy Gallant first caught sight of the man she’d come west to marry, he was galloping after a gang of bandits, peppering their worthless hides with buckshot. Russ Tibbolt was a far cry from the safe, respectable husband she’d expected when she agreed to become a mail-order bride. For one thing, he’d killed a man ten years before. For another, he was much too compelling for any woman’s peace of mind. With his cobalt-blue eyes looking down into hers and his powerful body doing its magic, how could she hope to win the battle of wills between them or keep her heart intact? For beneath the onslaught of Russ’s kisses, she was very far from being a reluctant bride. 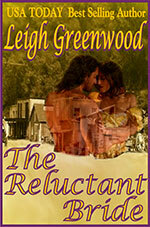 “Leigh Greenwood always provides one of the year's best western romances, but his latest tale may be the best in an illustrious career. The lead couple is a likable pairing that readers hope come together as their interplay is terrific fun to follow. However, what makes the tale is the realistic support cast as the audience gets a different taste on relationships that would send someone less courageous than Tanzy is back to St. Louis. A light and bright romance shaded just enough by the anti-romantic descriptions of family, upbringing, and the flawed pasts of both hero and heroine. The idea of a mail-order bride is always a fascinating one, but this story has a bit of a twist since the bride is unwilling. THE RELUCTANT BRIDE is an entertaining tale, and readers who like romantic stories set in the old west are sure to enjoy it. When Sibyl Cameron inherited half of her uncle’s Wyoming cattle ranch, she thought she’d finally found her ticket to independence. But when she met Burch Randall, she’d have to fight to make him see her as more than just anther empty-headed female. So she hardened her heart against his teasing gray eyes and scolded herself when his nearness made her tremble. He might own half of the Elkhorn ranch, but he’d never get his hands on her share . . . or anything else of hers! Burch couldn’t believe he had to share the Elkhorn with a headstrong southern beauty who didn’t have the sense the Lord gave a mule. Every time she opened her mouth he wanted to take her in his arms and kiss the stubbornness right out of her! He longed to take her out on the range one clear, starry night and show her how pleasurable surrender could be. Her creamy skin would glow in the moon light, her blue eyes would shine with desire. And then he’d cradle her smooth, supple flesh against his hard-muscled frame and their love would blaze like a Wyoming wildfire. Summer Ashton almost welcomed the news of the pirates boarding the Sea Otter. Anything would be better than being delivered to the old man she’d been forced to wed by proxy – even death at the point of a sword. But as the handsome pirate captain undressed her with his flashing sapphire eyes, she began to tremble with new fears . . . and new desires. For she sensed a fury in his man she did not understand . . . and passions she knew she could not control. Brent Douglas couldn’t believe he’d been lucky enough to capture the bride of his most hated enemy. Fate had finally give him the perfect opportunity for revenge. How much would the old earl enjoy his new wife knowing Brent had beaten him to the marriage bed? By the time Brent was through with the beautiful young countess, he’d know every inch of her luscious flesh, have tasted the sweetness of her first kiss . . . and have ruined her for any other man. For she’d spend the rest of her day yearning for one more night filled with the savage ecstasy of the captain’s caress. All Eliza Smallwood knew about men was to stay away from them. So when her guardian uncle forced her to sing in his Buffalo, Wyoming saloon, the untouched beauty was petrified with fear. Suddenly, a lean, rugged man shouldered his way past the leering cowboys and demanded that they respect her – or face his brand of frontier justice. Now Eliza didn’t know if she’d faint with relief or swoon with passion. For the instant he became her champion she vowed to spend her life showing her loving gratitude. Tough Cord Stedman didn’t have much use for females; the prettier they were the more conniving they were, too. But when he saw the black-haired songbird looking like a cornered lamb, the muscular cattleman had to defend her. Cord tried not to take advantage of the adoring girl, tried to keep his hands from roaming her alluring curves. But the instant his lips crushed hers, all the virile man wanted was to claim her as a stallion takes his mare, all through the wicked Wyoming nights. Brett Westbrook had earned his reputation as a gambler and a scoundrel. But even he was outraged when his latest opponent offered his own sister in place of the debts he couldn’t pay. Brett was determined to rescue the poor girl from her brother’s callousness . . . but once he beheld the beautiful flaxen-haired Kate, he found his good intentions sorely tried. Her sapphire-blue eyes bewitched him, her smooth, satiny skin seemed to beckon his touch. And soon he was wondering if she really was his to do with as he pleased. Kate vowed she’d never belong to any man – especially the arrogant, black-eyed devil who was so eager to tumble her into his bed. At first, he’s seemed like the answer to her prayers as he swept her away into the night. But then she realized he meant to seduce her, not save her! She vowed she would never succumb . . . but that was before his gentle kiss captured her trust and his tender caress sparked her most secret desires. And now she could not help but give him all he’d won with his daring seductive wager. Carrie Simpson had been warned – the rough country of Colorado was no place for a gently reared Southern lady. Nevertheless, she was determined to make her own way as the new manager of a stage station, feeding weary travelers and hitching their horses. There was only one problem – the husband she said was on his way would never arrive. And Carrie knew it was only a matter of time before someone figured out her secret. The one thing Lucas Barrow didn’t need was another distraction – and Carrie Simpson definitely was that. With her smooth skin and creamy complexion, she didn’t belong out in the wilderness. And where was this elusive husband she claimed to have? If Carrie were his wife, he’d never let her out of his sight. And even though Lucas knew it could never be, he couldn’t help imagining what it would be like to make her his beautiful Colorado bride. It was a dream come true. Sara Raymond was actually going to marry Lord Gavin Carlisle, the man she’d adored since childhood. She nearly burst with happiness . . . until she stood at the altar and looked into the dark, angry eyes of her betrothed. Still, Sara wanted to be his wife – and more. She yearned to see his eyes soften with passion at the sight of her, ached to feel his strong arms shelter her in ecstasy’s embrace. And she swore to make him her own, in fact as well as in name! Gavin Carlisle was trapped and he knew it. If he didn’t wed his father’s wealthy ward, the old earl would make his mother’s life a living hell. At least his bride was beautiful. Her creamy full breasts, smooth alabaster skin, and soft red lips were tempting, indeed. Still, his lust was not enough to make him forget how she’d schemed her way into his family. He vowed to take all the pleasure her exquisite flesh could offer, then coldly cast her aside. But once he’d tasted her honeyed kisses and explored her tender secrets, he found he could no longer live without desire’s sweet temptation. Pamela White needed a man she could trust, not this handsome drifter whose dusty boots and skill with a gun told her he was on the run. But with her father away from the ranch, and Pamela’s nearest neighbor encroaching on her territory, she really could use some help. She hoped that this stranger was more honorable than most, because the feel of his intense gaze on her body was beginning to make her wonder what it would be like to kiss him, and before long his dizzying embrace set her senses reeling beyond all control. Slade Morgan wanted to keep his past just that – behind him. In fact, his strongest desire was merely to buy a new horse and head straight to California. But once he set eyes on that dark haired spitfire who was running the Bar Double B Ranch, all thoughts of leaving vanished from his mind. He knew that once he gained her trust, he would reach his arms around those soft curves and tease this bossy beauty into wild abandon. Delilah Stowbridge had no need for useless pride. If repaying her family’s debt meant hiring herself out as a servant, so be it. She refused to see their land and possessions in the hands of a stuffy British merchant. But the rebels had other ideas. As an insider, Delilah could work as a spy for her country and uncover all the merchant’s secrets. But the secrets behind this Tory’s ice-blue eyes might unravel her in ways she’d never imagined. When the beautiful colonist showed up at his door offering to work in return for relief of her debt, Nathan Trent could only imagine the services she might provide. Once she installed herself in his house, he found himself drawn more to her flowing brown tresses and luscious lips than her skill with a broom and a rag. Nathan sensed that the spirited colonial had an ulterior motive for subjecting herself to such drudgery, but the closer he got to uncovering her secrets, the nearer he came to losing his heart to this rebel enchantress. To bounty hunter Trinity Smith, tracking down criminals wasn’t just a living – it was his life’s work. And this time out, he was bringing in the most daring desperado of all: Victoria Davidge, the gold-digging seductress who’d been found guilty of murdering her husband. But nothing could have prepared the hard-riding loner for the voluptuous vision that greeted his jaded eyes when he galloped onto her Arizona ranch. All silken curves and smoldering sensuality, the fiery-haired fugitive ignited a desire he couldn’t resist. Though hiring on as an extra hand seemed the surest way to uncover Victoria’s most sinful secrets, her comely charms were fast distracting him from his lawful duty. Victoria suspected there was something strange about her ruggedly handsome new employee, but she never figured him for a hired gun who aimed to take away her precious freedom for a crime she hadn’t committed. Well, let him try – she’d lead him a merry chase clear across the West. But she soon discovered that Trinity Smith wasn’t a man to be crossed . . . or denied. And from the moment he wrapped her in his bold embrace, Vicky knew she would never escape the searing passion he awoke in her hungry heart . . . a passion she would give up everything to claim.